We’ve heard a lot of buzz recently about the Anthropocene, the geologic epoch of man and machine. Does it exist? Are we in it right now? Later this summer, the International Stratigraphic Union will convene and attempt to answer these weighty questions. Deciding whether or not we’ve entered a new chapter in geologic history isn’t going to be easy. Normally, scientists use shifting rock layers, fossils, and geochemical evidence to place new ticks on the geologic scale. But the fingerprints of industrial society are not yet buried within sedimentary strata—they’re all around us. We’re creating them right now. To figure out if humanity has truly become a geologic force of nature, we need to be sure that our traces will persist long after we’re gone. Here are six pieces of evidence scientists are considering. If there’s one thing modern humans are great at at producing, it’s garbage. From CD-ROMs to styrofoam cups to e-waste, we’re quickly filling up our landfills, our oceans, and even our solar neighborhood with stuff that doesn’t decompose. So-called “technofossils” are likely to remain on Earth for thousands to millions of years, even if we humans don’t survive the century. Over geological timescales, the plastics buried in landfill sites may be in part a ‘time-bomb’ of plastic release. Some landfills, in low ground in tectonically subsiding areas, will simply be buried by more strata, to be fossilized as palaeontological middens. Where landfills are eroded, though, they will begin releasing their debris, including plastic, into the sedimentary cycle. As bleak as it sounds, when alien archaeologists excavate society’s remains in the distant future, they may assume that shopping bags, not humans, were the dominant life form on our planet. Plastic legacy aside, the age of humans will be marked by dramatic changes to the natural fossil record. For starters, there’s us. The human population has grown exponentially since the start of the industrial revolution, from roughly a billion people at the turn of the 19th century to more than seven billion today. Another four billion of us could be added to the world population by the end of this century. And humans haven’t risen to global dominance alone: we’ve brought along our domestic animals, including cows, pigs, sheep, cats, and dogs. In a geologic blink, the fossil record will be overtaken by a handful of two and four-legged mammals. To counter our meteoric rise, other species are fast disappearing—as scientists verified last year, we’re in the early stages of a sixth mass extinction. Meanwhile, organisms that aren’t going extinct are being scrambled about the planet in new and unnatural ways—think the introduction of Cane toads to Australia, zebra mussels to Lake Michigan, or rabbits to basically everywhere. Global travel, climate change and urbanization have resulted in a planet-wide migration, with some species marching northward as the poles warm, others moving into cities to occupy new niches, and still others hitching a plane, train or boat to the far corners of the Earth. If the fossil record was a book, the Anthropocene chapter was attacked by a hyperactive five-year-old with scissors, crayons, and glitter glue. It’s no secret humans are burning fossil fuels and releasing tremendous quantities of carbon into the air—some 10 billion tons a year at last check-in. Carbon dioxide is warming our climate, but it’s also reshaping atmospheric chemistry in a way that’ll leave an indelible mark, especially when you stack it alongside all the nitrous oxide, sulfur dioxide, chlorofluorocarbons and other industrial pollutants we’re pumping skyward. Given tens of thousands of years, newly formed ice layers at the north and south poles will trap tiny samples of our modern atmosphere as air bubbles, offering the geochemists of future a taste of the smog-filled skies of yesteryear. That is, unless we burn all of our fossil fuels and melt away the evidence. Agriculture has been reshaping our planet for the past ten thousand years, but all previous agrarian achievements pale in comparison to the technological advances of the mid 20th century. One of those, the so-called “Haber-Bosch” process, radically transformed the way we feed ourselves and our planet. Developed by the German chemists Fritz Haber and Carl Bosch, the process uses high pressure and heat to convert atmospheric nitrogen (the inert gas N2) into ammonia fertilizer, a feat that was previously only possible with the aid of “nitrogen fixing” bacteria. Suddenly, fertilizer was fast-acting and inexpensive, and farmers could apply it liberally to their fields. Crop yields boomed. The most obvious consequence of Haber-Bosch—enabling the human population to double again and again—overshadows the more insidious impact of all that extra nitrogen on our biosphere. Overspill from fertilization has roughly doubled the amount of actively cycling nitrogen in our biosphere, which has caused some species to become weedy at the expense of others. For instance as fertilizer seeps into lakes, rivers, and coastal waters, it fuels vast algae blooms that soak up oxygen and choke out other forms of life. The sudden turbocharging of Earth’s nitrogen cycle will leave an indelible mark in the geochemistry and ecology of the Anthropocene. One of the strangest ways humans are reshaping the planet right now has nothing to do with the Anthropocene at all—it has to do with the geologic epochs that came before. Humans are digging, drilling, mining, and blasting their way deep into our planet’s crust, through thousands of meters of sediment accumulated over hundreds of millions of years. No other species or natural process has ever done anything like this. For academics, a key point of debate is not whether the Anthropocene exists, but when exactly it began. Some argue for an early start date—say, the first evidence for a human-caused shift in atmospheric CO2, when Europeans migrated to the New World and proceeded to kill everybody. (This caused huge swaths of farmland to revert to forest.) Others say the proverbial “golden spike” should land in 1964. 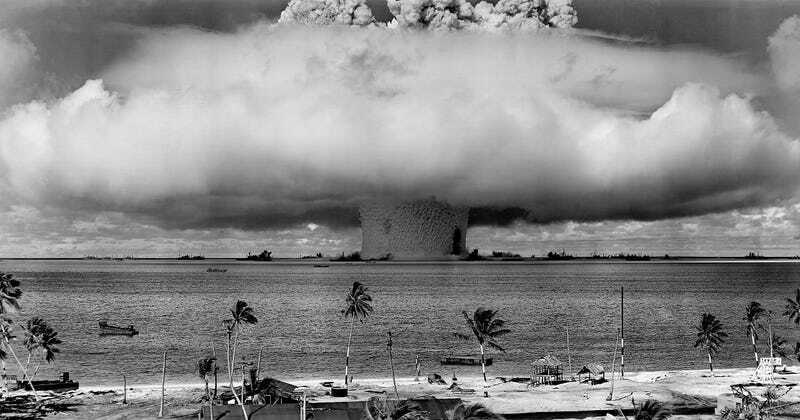 The year 1964 was a big one for nuclear weapons testing—so big that it caused a dramatic uptick in the amount of radioactive carbon, or carbon-14, in our atmosphere. The extra carbon-14 worked its way into the food chain and the biosphere, from plants to animals to humans to soil. If you lived on Earth during the 1960s or 70s, you contain an indelible trace of the Cold War in your bones—and it might literally herald the dawn of a new age. Despite all the evidence that seems to point toward a new geologic epoch, there’s still considerable scientific debate, particularly concerning whether or not the Anthropocene has begun. What if the biggest human-wrought changes to our planet are still to come? Should we really be rushing off to place this painfully brief moment of time all by its geologic lonesome? Are we too blinded by the present, too awestruck by our own participation in a planet-wide experiment, to put ourselves in such a long-term context? Perhaps. Then again, to the best of our knowledge, the 21st century is like nothing our planet has ever seen. That alone makes the age of humans—however short-lived—geologically remarkable.